The Freedom From Religion Foundation is urging the University of Michigan's football team to cancel a scheduled papal audience during its current visit to Europe. A concerned individual contacted FFRF to report that on its ongoing European trip, the University of Michigan football team is planning to attend a ceremony by the pope at the Vatican this Wednesday, April 26, at 10 a.m. local time (about 4 a.m. in Ann Arbor, Mich.). The local media has reported head coach Jim Harbaugh as stating that he wants this religious event "to be the greatest experience of our players' lives up until this point." Far from merely a speech by a celebrity, a papal audience is a religious activity in which the pope prays and delivers an "Apostolic Blessing" upon those in attendance. It is inappropriate and unconstitutional for a public university to include a religious ceremony, particularly a sectarian one, on a European trip that an entire student athletic team is expected to attend. "The University of Michigan is showing favoritism to one religion, Roman Catholicism, over all minority religions and nonreligion by taking students to a devotional Catholic event, led by the head of the Catholic Church," FFRF Co-Presidents Dan Barker and Annie Laurie Gaylor write to University of Michigan President Mark Schlissel. "This practice violates the well-established constitutional principle that the government must remain neutral toward religion." By including a papal "blessing" as part of a team trip to Europe, the university appears to be endorsing Pope Francis' and the Catholic Church's sectarian religious message, FFRF adds. Nearly 30 percent of Americans are non-Christians, either practicing a minority religion or no religion at all, and about 44 percent of Millennials — an age group encompassing every player on the Michigan football team — are non-Christian. Further, Catholics are a distinct minority of Christians in the United States. Surely, the university would expect outrage from students, parents and faculty if Coach Harbaugh had scheduled the team to attend a ceremony by a top Muslim cleric, where they would participate in prayers to Allah and receive an Islamic blessing? Or a field trip to meet Richard Dawkins in person and discuss why God is a "delusion"? The current situation is no different. 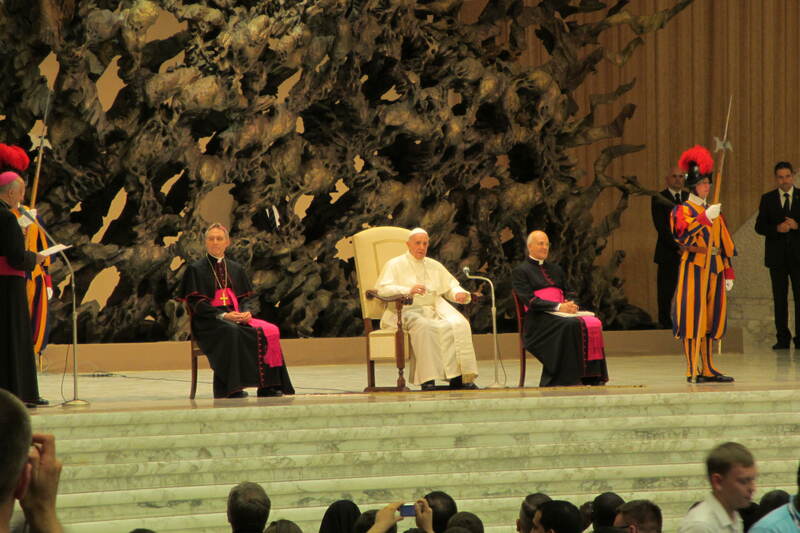 It is no defense that students are not required to participate in the papal audience. Coaches should be aware of the tremendous influence they have on their athletes. FFRF's 2015 "Pray to Play" report reveals what should be an obvious truth to anyone with experience in college athletics: "Athletes do not view coaches' suggestions as optional." When the university's football team takes a team trip to Europe, students understand that they are expected to attend all team events, particularly when their coach states that the event should be "the greatest experience of our players' lives up until this point." In addition, the U.S. Supreme Court has summarily rejected arguments that voluntariness excuses a constitutional violation. FFRF is asking the University of Michigan to take immediate steps to avoid this constitutional violation by canceling Wednesday's papal ceremony as an official item on the itinerary. The Freedom From Religion Foundation is a national nonprofit organization with more than 28,000 nonreligious members and chapters across the country, including more than 700 members and a chapter in Michigan. Its purpose is to protect the constitutional principle of separation between state and church.